Welcome to the 2016-17 school year! As I ease back into my alter ego as eater and reviewer of school food in Ojai, I would like to announce some (hopefully) exciting changes and updates. 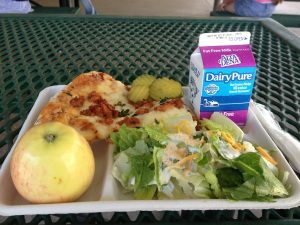 This blog did indeed start off as something of a spying expedition to see what, exactly, my kid and her peers at the Ojai Unified School District (OUSD) schools were being fed for lunch. Over the last two years, however, as the OUSD and other districts in our county (and around the nation!) have taken up the challenge of making school lunch more healthful, tasty and popular with kids, I have found that the lunches I have been eating are, for the most part, fine. Of course, there are standouts at all meals, both on the plus and minus sides (see below for a discussion of the merits of fresh-baked pizza crusts and the demerits of cheap pickles). So the core mission of the blog, that is, to give an unvarnished report on what the kids are being fed, will not change. However, as I have been eating school lunch on a regular basis, I have begun to appreciate some of the insane complexity of feeding our district’s children, given the constraints of budget, time, and space. For one thing, I have been observing the REAL Ojai School Lunch Monitors. These are hardworking, “boots on the ground,” largely part-time and probably vastly underappreciated OUSD employees who actually help your kid eat lunch. They assist Nutrition services to get the food to the kids, get the kids with the food to the tables, get the food into the kids, get the kids to put the trash into the appropriate receptacles, and finally, get the kids somewhere to safely work off some energy before class resumes. Watching these folks at work made me realize that I cannot really go around continuing to call my blog the Ojai School Lunch Monitor as I certainly could not even begin to do that job if my life depended on it. 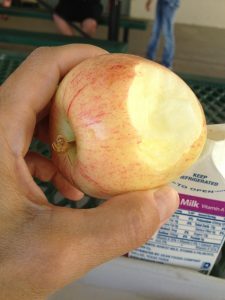 Also, two years ago, we at Food For Thought Ojai were excited with the positive changes in school food being made by OUSD Nutrition Services, but we were worried that they might not stick. I think now it’s pretty clear that OUSD is committed to the goal of providing as much home-cooked, locally grown, minimally processed food at lunch as possible. I submit that it is appropriate at this point to back off (a little) from our position as a watchdog/monitor and expand our energy into collaborating to continue to move school food in Ojai (and elsewhere) into a positive direction. 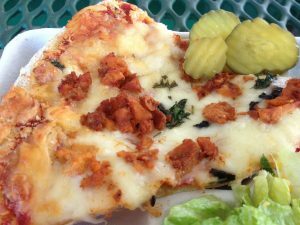 Finally, as I start my 3rd year doing the blog, I realize that eating the Ojai school lunch often inspires me to muse on topics that aren’t necessarily limited to Ojai, School or Lunch and are really just my own personal opinion about stuff. So with that in mind, the new name of my blog (which I reserve the right to change next month and every month if I feel like it, even though that would be kind of confusing and counterproductive) will be “School Lunch Confidential” (apologies to James Ellroy), where I pledge to provide you with an “off the record and uncensored” first person account of what’s for lunch at the OUSD, and also some other random thoughts if you happen to be interested. I ate my first lunch of the year at Meiners Oaks Elementary on Tuesday September 27th, 2016. Actually, I had initially tried to eat lunch at Nordhoff High School where my daughter is now a freshman. I was kind of looking forward to mortally embarrassing her in front of her friends by my mere presence. However, it turns out that you cannot just show up at Nordhoff unannounced and eat lunch. They take their closed campus very seriously and you have to be pre-vetted by the assistant principal before they will let you come in. So I will work on that for later in the year. My misadventure at Nordhoff had set me back a little, so instead of eating lunch early with the cute and generally cooperative 2nd and 3rd grade little kids like I usually do, I got there in time to eat with the 5th and 6th graders. It was hot and the kids were still in summer mode. There was lots of yelling, poking, scuffling and generally uncivilized behavior. Amazingly, everyone managed to keep it together enough to stand in line and get their piece of cheese or barbequed chicken pizza, salad (or when that ran out, carrots), apple, and, incongruously, pickles. I recently listened to a podcast about foodbanks where one of the things I learned was that foodbanks get a lot of donated pickles which they hate and really have no use for. At the time I found this a little surprising: I eat pickles a lot, and, after all, they are technically a vegetable. However, I now realize that I am actually quite picky about pickles. The ones I like are the fancy teeny tiny French cornichons or the Clausen “Always chilled, never heated” mini dill pickles. The ones that the foodbanks, and apparently OUSD, get are the industrial sour, floppy nasty variety. Yuk. I don’t think the kids liked them either. The barbequed chicken pizza was yummy, however. I liked the nice chewy crust and the hint of green vegetable matter (cilantro perhaps?) I would have appreciated a little more chicken and barbecue sauce, but what was there was nicely spiced and cooked. My salad was fine, especially because there was some cheese available to put on it. I was particularly impressed with my apple. First off, it was the right size (ie: not gigantic). Also, it was sweet and crunchy. As I was downing my tiny box of milk, I realized I was still thirsty. Probably all the salt from the nasty pickles. Unfortunately I had left the reusable water bottle that I carry around in hot weather in the car. I thought about going back into the cafeteria and buying a bottle of water, but I normally try not to buy plastic water bottles if I can help it. Also, I was feeling really irritated about the plastic water bottles that were inexplicably being thrown around in the air by many of the kids. One boy got his bottle stuck in the rafters of the shade roof and was enlisting the help of his friends to throw their bottles up there too, presumably in the hopes of dislodging it, I guess. While I was wondering why the school lunch monitors weren’t confronting the irritating plastic-water-bottle-throwing boys, I observed a girl walking up to a gleaming silver box near the lunch tables that I realized is one of the new “hydration stations” that I have been hearing about at Food for Thought Ojai board meetings lately. She filled up her very stylish metal reusable bottle under the spigot. It made my heart glad to see that: a child willingly drinking water out of a reusable bottle! 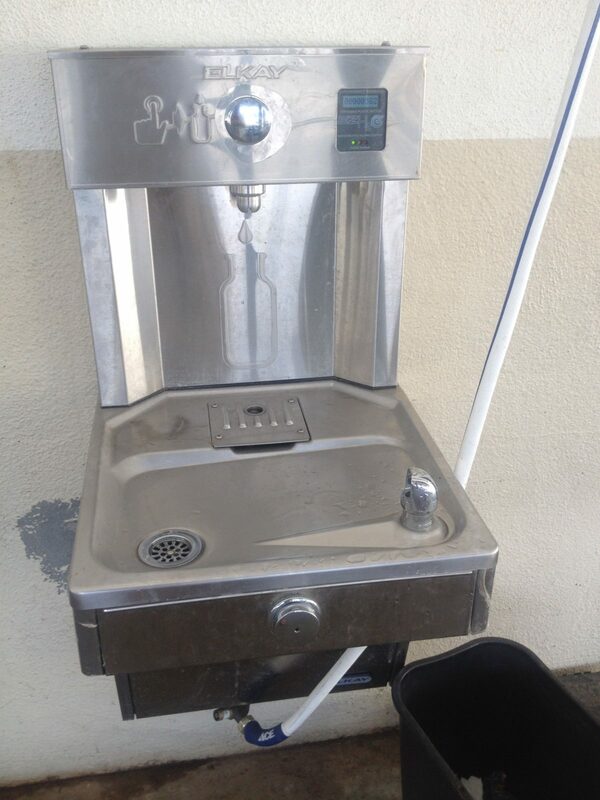 So, I stopped by there for a nice long cool drink of filtered water from the attached drinking fountain. I also noticed that there was a hose attached to the thing that was supplying some cooling misters that I had initially neglected to notice in the rafters next to the errant water bottle. When I was done with my turn at the drinking fountain, I found it quiet all of sudden. I realized that the kids had all been whisked away, the tables were cleaned up and I was alone to sort my trash in peace. The school lunch monitors had apparently been cleverly allowing them to get out their screaming, running around, bottle-throwing energy. They had now herded them into the air-conditioned cafeteria to calm down, cool off and watch a movie for a few minutes before the bell rang. Amazing. Wow great article! Very informative and fun. Makes me very happy to know the hydration station are up and running. I had 2 grandchildren in the system last year but no more but I still enjoy knowing what’s up at our schools! Thank to the Ojai School system and Food for Thoughts hard work getting our kids a healthy meal at school.